I am downloading bwm in above link but still doesn't has tunnel feature. Thanks. This is quite strange. May be an older copy has been cached by a proxy server? Thanks for the update link Andrew, btw why after I install bwm in my computer suddenly cannot connect to anywhere (internet, etc) it seems that bwm disconnect my computer connection also even I didn't do any rules creation yet, in version 2.9 my computer still can connect to internet,etc. Is this normal?. Thanks. No it's not. Try uninstalling it, rebooting and installing again. Like many others here I am very excited that you released a new version with so many wanted features! I will install and test now and see how it goes. It's great to know you are still working on bwm! I installed the latest and set Tracking to IP address own rate source, there is one user connected and it shows about 20 sub rules now. Is this correct? From what I see, the filter is working on each individual stream or connection and NOT grouping by IP address. I wanted to limit the rate per Local IP address to say 5mbs, but from what I see that rate will apply to each connection they make and not their connection as a whole. So If user A with IP 192.168.1.10 is streaming two videos, I want him to have total 5mbs and not 5mb per stream. Please explain how bwm works in this case. Works as intended when I set an IP Range. I remember about the refresh thing and we'll do it as soon as more priority tasks have been done. In the mean time, we have added an option to specify domain names, which could be especially useful for banning certain web-sites. Domain names can be specified in a rule or in a group in the form of domain.tld. Any sub-domains will match it too. For example facebook.com will match facebook.com, www.facebook.com, m.facebook.com and whatever.subdomain.facebook.com. I love where this new version is going! many new features and looks great! Please keep up the good work, I will buy this version as soon as you have said it is stable. I have been playing around with the trial version and found the following problems. Port Mapping freezes up the BWM service in Win Server 2008, you still have access to the GUI and can make changes but traffic is broken through the internal bridge. It works in version 2.9 perfectly but not in 3.0.1? I have selected mapping under advanced in the rule, and left the port as "any" under the mapping option. I have also tried port 80 under the port option above mapping. Port mapping is setup correctly to the URL of server and I can access it when trying on my PC. You have to disable the rule and reboot the machine before traffic starts flowing over the internal bridge again. Secondly I have found that, randomly any domain names I have added to a group get scrambled, so I have to deleted the group and add them again. What happens is, the last gets added to the first domain below itself. Ronny, could you please post your .DB file here or email it to me, so I can check it for you? We have fixed a number of issues in version 3.0.2 available from the BWM home page, including this one with chaining domain names. Please give it a go. As to the torrent detection, well it uses heuristics and there is no guarantee it will always catch it. It however improve over time. Alternatively you can use "Penalties" that allow you to discourage heavy downloads regardless of protocols used. I have many PCs with wireless and Wired LAN or multi LAN and I want to add all of their mac address in one rule. Software doesn't support it properly so I use groups. I have 49 groups so, that they are sortable by name! So I should search the whole list to edit or change a group. Please support in newer version. What exactly doesn't it support properly? What's wrong with the groups? 1. I want a limitation for a PC which have wlan and 4 lans eg. It's a host not a group but I should define it as a group. 2. In addition to that group list is not sortable. 3. It has no searchable area to search for a name. 4. It accept the same mac for many times so you can't confirm if MAC address has been used before. 5. There should be a kind of rule to shupport each host in a group or range seperately. eg. if you specify 1Mbps for the range from 192.168.0.11 to 192.168.0.20, then every host in this range has 1 Mbps and not all the range share the whole bandwidth. V. 2.91 didn't support seprate upload and download limit in NAT mode. I don't know if it's supported in this version. This is topic is about version 3.x, which does support multiple streams per rule (with automatic creation based on IP or MAC address). So probably you won't need to use the groups at all with version 3. With all the respect, that was just an answer for one of my requests. Thanks for that. Think about 32 people in a group, all have same rule properties. If it's generated by wizard, and I need a change in their rule, I should do that for 32 rules. You can tell me that our software will never support this but I tell you it's necessary for me and many others. Version 3 supports editing multiple rules at once. No need to go and edit each rule individually, if that's what you are asking about. Hi guys, sorry I haven't been doing a lto of testing, I've been a bit run off my feet of late. FYI, just installed build 3.0.2, it has come up saying the 30 day period has expired. Might want to lengthen it for beta testing. On April 29 I was emailing new license keys for this version to everyone purchased BM. If you have not received a license key, simply drop me a line through support and I'll email your key again, so you then can run a licensed copy, not just a trial. Is there a way to put the "throughput graphic monitor" and the "live usage monitor" working in a FIXED scale? I think that, in this way, it would be more informative. For example, the max value could be fixed to the limit rule rate. If I not mistaken, in the last versions, BM worked in this way. Congratulation for your great work. A suggestion: would it be possible to have quota notifications sent out at a certain percentage of quota usage, rather than only when it is exceeded or reset? Having looked through this whole string and while i understand exporting my rules one issue i have is that i have 3 IP Groups Setup, each has around 50-100 IPs in them and i uses these groups to create rules for our office tenants. When i upgrade i dont really want to have to sit there and type in up to 300 IPs, which i will have to as i cant put a range in as we have odd IPs scattered in these ranges that are excluded as they have unique rules specific to their IP as apposed to the rest of the tenants in that range. Is there a way of exporting the IP groups as well to put into version 3? @mythra: yes, I will added an option to have a fixed scale where possible (except unlimited rules). @John: good idea, we will add percentage notifications. @Chris: all your rules, groups and everything else (except the global settings) can be imported into v3. Thats great to hear, is there a guide on how to do this? As i say i figured out how to do the rules, but could not see where to do the groups etc.. When you export your rules to a XML file (in version 2.x), groups, quotas and other entities are exported too. You can open this file in any text editor to make sure they are present. 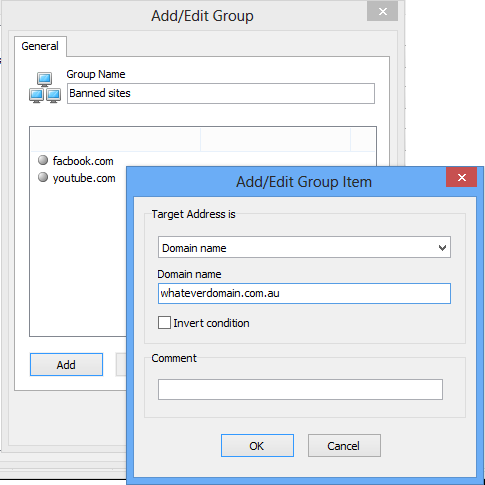 After you have version 3.x installed, you import that file and everything, including groups takes its place. Simply click the drop-down list when importing and choose V2 XML file rather than DB file (as shown on the screen shot in the begining of this thread).